This is the second card for my second So Sketchy layout. I made it as a thank you for my girlfriend, Rebecca, the one who makes the crocheted flowers. She is a wonderful pianist and piano teacher. She helped the kids work on a song for the congregation party I mentioned a while ago. She had them all over to her house to rehearse and although there was no piano at the party, she did record herself playing onto a CD for the kids to sing to. My son, Jameson, is a real performer at heart and loved every minute of the attention even though he was one of about 15 kids! At the end, Jameson stretched his arms out wide, TA-DAH style, a few other kids did too, you could tell he was so proud of himself and LOVES an audience! Everyone thought it was great, especially me! So this card is for Rebecca; hope she enjoys it. ETA: I gave it to her last night, she loved it! The music paper is real vintage music I bought for about 10 or 15c each sheet! It is yellowed with age and the edges are imperfect and dog-eared ~ exactly how I like it! I even decorated the inside, I NEVER do that. This one was very fun but it is tricky getting the woven paper strips to stay straight! TIP: If you want to try this, work from the center out and put a bit of adhesive between each layer. Just a bit, that way, if you get out of square, you can adjust it! Use more adhesive on the layers that will be cut on an angle because the paper tips want to stick up. I tried stamping the large treble clef image from a retired SU! 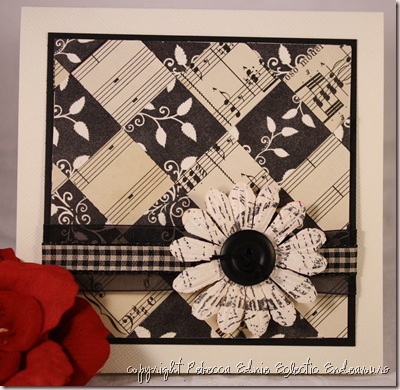 set on the flower, it looks cool, but not like a treble clef because it was too big! If I’d remembered that I have a music wheel stamp, I would have used that. Yes, I am in the un-illustrious position of beginning to forget which stamps I own! ***GASP*** One more quick thing, you probably can’t see it, but the vanilla CS has a diagonal texture to it! Cool huh? 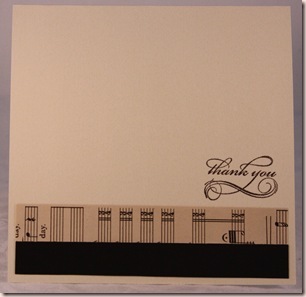 Stamps: treble clef-retired SU!, thank you-Elegant Notes SU!